For your consideration is a stunningly authentic Italian Mini Cooper 1300 Innocenti. Made in Italy, the Innocenti Mini was produced under license between 1965 and 1975 by the Italian factory famous for the production of Lambretta scooters. Although basically the same car as a Cooper S they did benefit from a better electrical system (more fuses) and nice wind up windows. 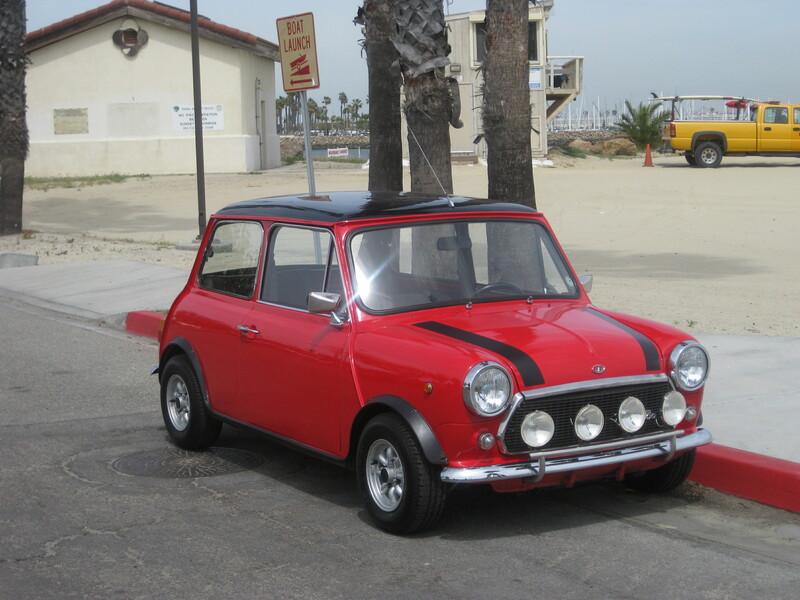 This very genuine 1972 Mini Cooper 1300 Innocenti up for auction was imported into California in the early 90’s from Italy. Registered in California since before 2007 when it was purchased by the current owner. Since then it has been very well maintained and garaged throughout its stay in the West Coast sunshine. The red paint is in excellent condition, no touch ups needed, although there is touch up paint should it ever become necessary. The doors open and close with ease, fit and gap are very nice, and the windows roll up and down extremely well. The back windows latch open and close. The windshield and all windows are in great condition with no cracks and all very clear, the only window that doesn’t seem to want to open is the drivers quarter light, but this will be a minor fix. There are also no windshield wipers though the mechanism does work, it just needs the wiper arms. If the owner cannot find the originals we will fit some prior to delivery. The rims and tires are in good shape and there is plenty of tread on the tires all around. The interior is outstanding with lovely gray and red piped upholstery that gives the car a very sharp look. All the seats and upholstery are reported to be original from factory and considering they are beyond decades old they are in exceptional condition. Also the backseats have these neat little storage compartments on either side. 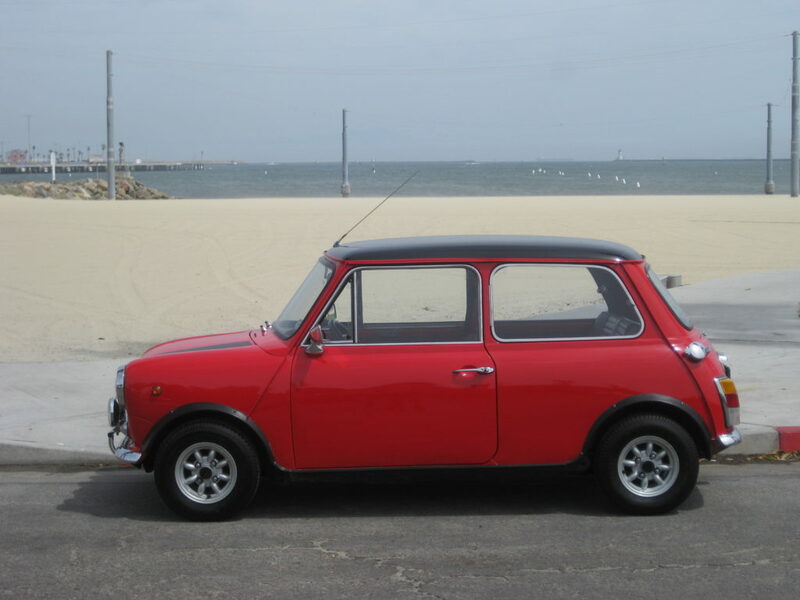 All original to the car, and although Mini Cooper’s are notoriously small, when inside, it doesn’t feel that way. The floors underneath the drivers and passengers seat have been redone very nicely, so there is no rust in the car. All the interior and exterior electrical items are working very well, including the heater fan, and the interior light which works in all 3 positions. Starting from cold, the choke works nicely, and the engine has a lovely powerful sound to it. You can feel the vibration in your seat as soon as you turn the key and it is nice to feel a part of the drive as opposed to just a passenger. The oil pressure is good, and the car sounds very healthy overall. The indicators self cancel, the headlights and sidelights are in working order. The rally fog lights work as well. All the gauges are original to the car which means they are all in Italian. A nice reminder of just how authentic this Mini Innocenti actually is. All gauges work except for the Amp gauge which needs to be reset to match the previous change from a generator to an alternator. The horn also does not work, again a minor fix. The engine compartment is nice, tidy, and complete. The 4 speed synchromesh gearbox is tight and shifts nicely into gear without any unwanted noise. The gearshift on the car now is not the one that came with it from the Innocenti factory in Italy, however the owner has provided the factory gearshift should the buyer want to change it out. There is no play in the steering and it stops nicely upon braking, pulling up straight. The clutch works well without any signs of slipping. There is a small indentation on both the drivers’ and passengers side doors. Very hard to tell, and even harder to photograph, because there is no paint chipping away and it is so minor (a good dent guy can easily repair this). This Mini Cooper 1300 Innocenti is the real deal, brought over from Italy to grace us with a superior and timeless assembly of a very classic car. 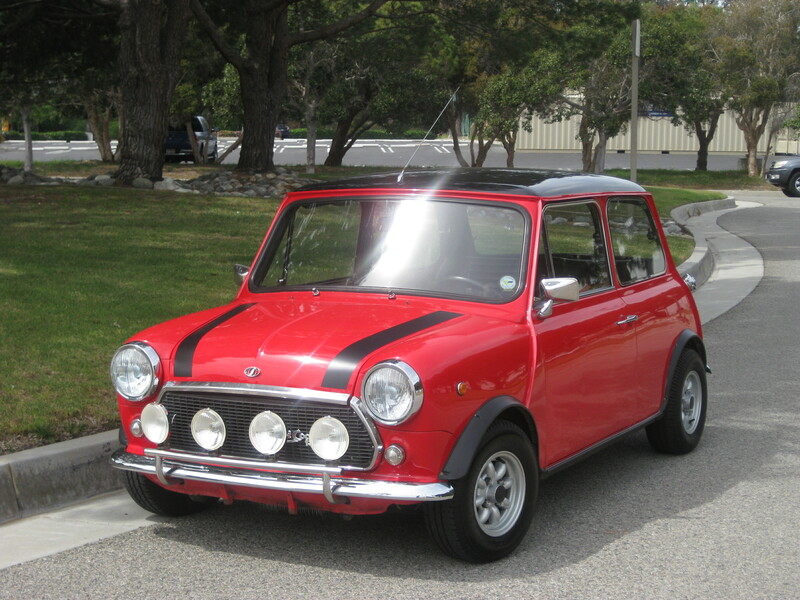 Unlike most Mini Cooper’s that have been modified beyond return this car is a wonderful example of what a Mini Cooper was meant to be and still can be. If looked after this car will only appreciate more in value over time, because unchanged Mini’s are harder and harder to come by.